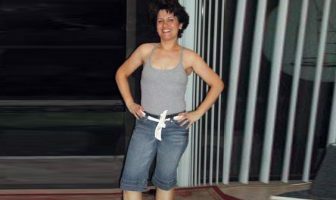 Pounds or Inches Lost: I lost 26 pounds! When my knees and back started to bother me at a young age. I was also unhappy when I looked in the mirror. I didn’t want to continue to have knees and back pain at 21 years old. The most challenging thing was all of the temptations. I started seeing results in 1 month. It only took my 3 months to lose the weight. 1 year. The most important factor is to avoid being tempted by unhealthy things. Sure, you might feel satisfied eating something unhealthy but when you don’t see any results you’ll eventually give up the bad foods. My positive self-esteem is a big motivating factor to keep it up. It provides me with a confidence boost. Hang in there and don’t give up! All the sacrifices are worth the rewards. Drink honey, lemon juice and green tea (3 times per day). 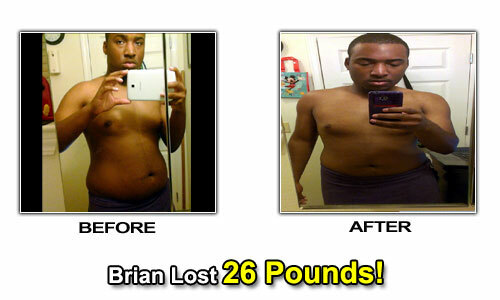 Brian’s Weight Loss Eating Plan! Greek yogurt and water with lemon juice or a whole grain bar with hot green tea, honey, and lemon juice. Or, some almonds with a protein drink. Salad with light dressing and hot green tea. Or, a fruit smoothie. Grilled chicken with brown rice and hot green tea with honey and lemon juice. Or, a chicken salad (light mayonnaise) and water with lemon juice. Almonds, sunflower seeds, pretzels and side salads with light dressing. Various strength training exercises with 40 pound dumbbells. Running for 30 to 40 minutes a day.